This review presents a comprehensive and systematic overview of image-processing techniques that are used in automated feature-detection algorithms applied to solar data: i) image pre-processing procedures, ii) automated detection of spatial features, iii) automated detection and tracking of temporal features (events), and iv) post-processing tasks, such as visualization of solar imagery, cataloguing, statistics, theoretical modeling, prediction, and forecasting. For each aspect the most recent developments and science results are highlighted. We conclude with an outlook on future trends. Invited Review, presented at the “Solar Image Processing” Workshop #4, Baltimore, MD, 26 – 30 October 2008. The original publication is available at www.springerlink.com, DOI: 10.1007/s11207-009-9474-y. Bastian, T.S. : 2006, Radio interferometry and Fourier synthesis imaging, http://hesperia.gsfc.nasa.gov/summerschool/lectures/bastian/Notes_on_Synth_Img.pdf. Dalla, S.: 2006, Solar system data access and analysis with AstroGrid, http://adass.org/adass2006/presentations/dallas.pdf. 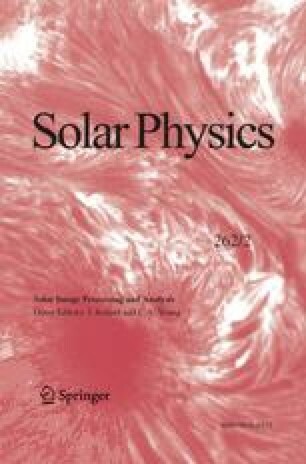 Davis, C., Bewsher, D., Davies, J., Crothers, S.: 2008, Working with data from the NASA STEREO Heliospheric Imager an essential guide, http://www.sstd.rl.ac.uk/Stereo/Documents/HI_user_guidejuly.pdf. Gurman, J.B., Dimitoglou,G., Hourcle, J., Bogart, R.S., Tian, K.Q., Hill, F., Suarez-Sola, I., Wampler, S., Martens, P., Yoshimura, K., Davey, A.R. : 2005, The Virtual Solar Observatory: Still in a Small Box, http://umbra.nascom.nasa.gov/vso/docs/AGU200505/Gurman_SH43B-03.pdf. Inhester, B.: 2006, Stereoscopy basics for the STEREO mission, eprint arXiv:astro-ph/0612649.